Tsarouchis’ wonderful portrait of a young aviator dates from the mid-1950s, when he had encountered and profoundly appreciated the paintings by the Fauve Henri Matisse in Paris; Tsarouchis had introduced flat forms and vivid colours in his own painting as early as the 1930s. 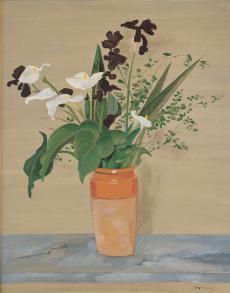 Yet, in several instances, he employed traditional modes of expression, opting for a naturalistic rendering. Here, he depicts the face of a young man against a dark background; he moulds the volume of the figure by turning from darker to lighter colour plains, echoing the Byzantine practice. Tsarouchis painted Clay Vase with Lilies with a true sense of in the 1960s; the theme appears in other works the artist produced during that period, in which he depicted male figures in interior settings. He studied at the Athens School of Fine Arts (1928-1933) in parallel to his apprenticeship under Fotis Kontoglou, who introduced him to Byzantine art. From 1928, he worked as a stage designer, with important projects in and outside of Greece. He travelled to Paris and Italy, passing through Istanbul and Smyrna (1935-1936). In Paris, he studied art in the great museums, discovered the work of Theophilos in Tériade’s collection and met artists, including Henri Matisse and Alberto Giacometti. 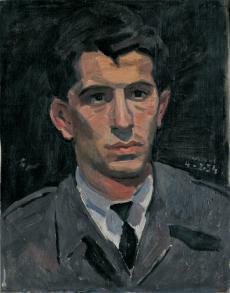 In 1938 he held his first solo exhibition in Athens, featuring works made from 1929 to 1937. He participated in many group exhibitions and international events (Alexandria Biennale 1955, Venice Biennale 1958); he also showed work with the ‘Armos’ group of artists, of which he was a founding member. Solo and retrospective exhibitions of his work were held at the British Council in Athens (1952), the Grand Palais in Paris (1980) and the Macedonian Centre of Contemporary Art (1981). With the coup in 1967 in Greece, he moved to Paris, where he lived until the early 1980s. Since 1982 the Yannis Tsarouchis Foundation and Museum is in operation at his home, in Maroussi, Athens. A leading figure of the Generation of the ’30s, he fused a variety of influences – the Fayum portraits, Byzantine and folk art with Renaissance and Baroque art – shaping his individual style through the achievements of modern painting, especially influenced by Matisse.